It’s the hot topic of today. So much media and so much noise. It’s the time we are living in. But as I read Joel chapters one and two this morning, the word “solemn” jumped out at me. In these chapters, a call to repentance is given by the Lord. The Lord had seen the vile behavior and the hardened, rebellious hearts and yet, He was still willing to give the people another chance. What did He ask them to do? 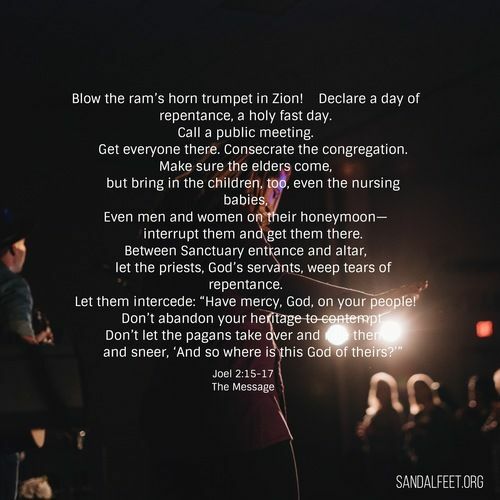 Blow the trumpet, call a fast, call a solemn assembly, assemble the elders, gather the children, and cry out for mercy (Joel 2:15–17). Solemn generally means to have a seriousness to something. When I think of solemn, I think of the opposite of spectacle and show. (The Message translation (a modern vernacular) doesn't even include the important word "solemn.") It makes me think about our national days of prayer and our acts of worship. Somehow these things have become a show in and of themselves. These events are perfectly planned, perfectly scripted, and perfectly timed with so many cameras and so much movement. I’ve yet to see anyone fully lamenting and laying bare their soul and concern for the country. When I think of the type of assembly the Lord was calling the people to in the book of Joel, I don’t picture what we see today. Every time the words "sound the trumpets" appear in the Bible, it is a call to the people of God to gather for and engage in battle. It's about time that we, Christians, stop battling against one another and remember who we represent...Jesus. Let's engage in the spiritual battle that is taking place all around us by praying, pressing into His Word, and living out His commands to love Him and love others. Let's give up our comforts and our agendas and remember what His plan is: to praise Him all our days and to share the Gospel with people...every single person; not just some people or those we feel like sharing the Gospel with, but each person He came to die for. Remember, He loved you when you were a sinner far from Him. The trumpets are sounding all around us. This generation is a mess and in a fight for its life. Are you willing to give in and fall prey to the things of this world or are you ready to join the battle to revive a generation like no other time before in history? The battle is not won with our words hurled at people, but it is won in our hearts. If you love people enough and care about this world, your nation, your city, your family, your friends, and your neighbor, the darkness in this world should alarm you. The great news is that it is never too dark for God's light to penetrate. How about instead of yelling at people and cursing those who are in the darkness, we shine our lights really bright so the spiritual orphans can find their way home to their Father? He can change anyone's heart just like He did with yours. We have a serious problem in this country (as is true for many countries around the world), and we are spiraling out of control. Natural disasters are destroying our land, and our people are being devoured by one another. At some point, enough is enough. In the grand scheme of things, hateful and frustrated words toward one another don’t matter, protesting doesn’t matter, and even votes don’t matter. What matters is that we gather together, weep, mourn, fast, and pray to the Lord to soften our hearts and the hearts of others. And most importantly, we need to hope the Lord sees our repentance as holy and acceptable before His eyes and delivers us from this path of self-induced destruction. I’m tired of waking up to reports of mass shootings, stories of parents killing their children, accounts of innocent people killed while driving because someone was under the influence of something, news of chaos in the White House, unrelenting media, angry and violent protesters, escalating divorce rates, drunkenness abounding, the ease at which we legalize mind-altering drugs and alcohol, overpopulated prisons, and the list goes on and on. As I stare at this list, none of it is what God prescribes. There isn’t an ounce of love in any of it. Just typing the list brings a wave of sorrow. What can we do? Let us solemnly assemble…anyone who is tired of the chaos…and watch what the Lord will do. No media, no hype. Let us blow the trumpet and gather for one purpose…to let the Lord know how sorry we are that we’ve messed up and allowed Him to be replaced. It is certainly not the first time in history this has happened. that a nation has traded in its gods for gods that aren’t even close to gods? Stand in shock, heavens, at what you see! Let us not be the generation in America that is marked by rebellion and destruction or mocked by unbelievers. Let us instead be the generation that is marked by a dependence upon the Lord like no other generation in history. We are spiritually bankrupt, and our manmade cisterns are disintegrating by the moment. The writer in Hebrews challenges the people to warn each other every day while it is still “today” (Hebrews 3:13). Why? Because a few lines before that, the writer reiterated the words God spoke to Moses about the people never being able to enter into His rest because of their hardened and rebellious hearts (Hebrews 3:10–11). I don’t know about you, but I am much more inclined to want His eternal rest and peace than to live in a world of chaos and destruction. I hope you do, too. We need to pray for more opportunities in this nation for the Gospel to go forward—not opportunities to share about agendas, beliefs, and policies—because it is the only thing that changes people from the inside out. Let us pray that the people who know and love Jesus will gather (shepherds, gather your sheep). And let us also pray that the people who are far from Jesus will gather with us as we gather because the Spirit can reach hearts when we gather and invite Him into our presence.